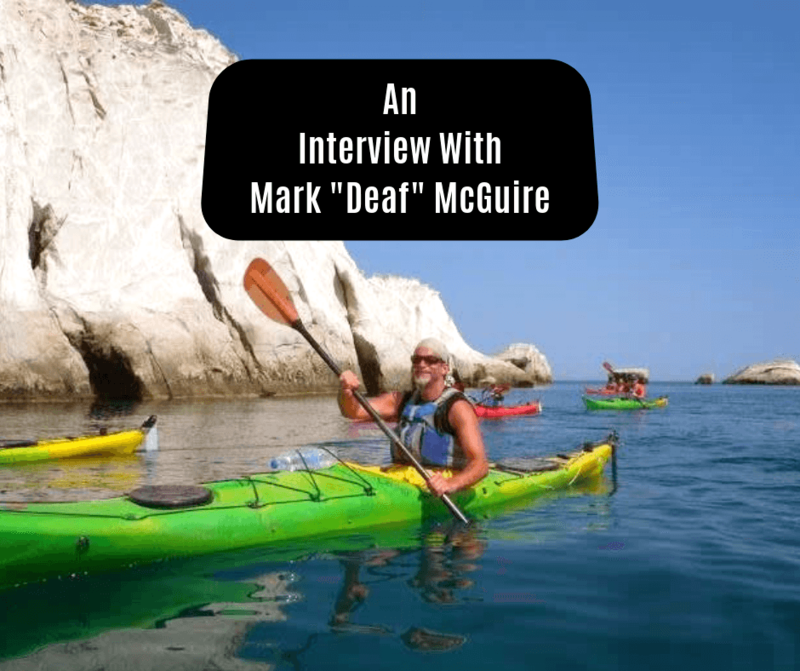 In this post, we interview Mark “Deaf” McGuire. A passionate traveler, he hopes to create a better world for Deaf and Hard of Hearing people. Q1 Tell us a little bit about yourself. Where did you grow up? I love how you worded that question. I was born and raised in my home state of Connecticut. After high school, I ended up moving all over the country before I realized I was a nomad. To this day, I’ve lived in ten states. Who knew this little boy would one day grow up to become a nomad? Q2 How long have you been blogging and what is your blog about? While I started when WordPress first came out, it wasn’t until I came up with my social brand name that I finally found a domain name I liked enough to keep blogging with. In general, I try to keep my focus on accessibility and inclusion as a Deaf nomad. Q3 What are some of your most favorite travel memories? That’s a great question. The list keeps growing every time I travel. Here’s a list of a few memories. ● Grilling on the top deck while the whales feed next to us in Point Adolphus, Alaska. Highly recommend visiting Milos, Greece. Their amazing coastline is easy to explore by kayak. Q4 What are some of the biggest obstacles you’ve faced while traveling with a disability? It boils down to awareness and communication. While I can understand some people better than others, lipreading is a guessing game where I fill in the blanks as quickly as I can. There are ways to work around this as most people can read and write or a few who know enough sign language to communicate. The Internet is a major game-changer when it comes to travel. Without access to the Internet, it’s harder to make plans in advance to move around or travel. In most cases when the Internet is not available, I rely on the kindness of family, friends, and strangers to call for me. Still, despite all the advances, it seems the majority of the obstacles I deal with comes down to a lack of awareness. More often than not, hearing people keep expecting me to understand everything they say. It’s not so much about a language barrier but rather self-awareness that it takes two to communicate. For example, I’m aware that people don’t always understand what I say. When that happens, instead of giving up, I try other words or methods of communication. This is not always the case when it’s the other way around for hearing people who struggle to communicate with me. Q5 Do you have tips for anyone trying to communicate with a deaf traveler? First of all, don’t be afraid to communicate. Keep in mind that you and the deaf traveler are both breaking down the same barrier at the same time together. It’s okay if either of you don’t know the language, there are other ways to communicate. Simply become aware of yourself and adapt as you find that perfect medium. Everybody communicates one way or the other regardless of they are Deaf or not. For example, reading your questions and writing out my answers is a way to communicate. Communication is an experience to enjoy when everyone understand each other. If you are unsure how to start the conversation, understand that it’s okay to break the ice with this really easy question to answer. Ask them if they prefer lipreading, signing, or writing. Once you know their preference, it becomes easier for both of you to understand each other. Q6 What are some things the travel industry could do to make travel more accessible? One of the easiest thing to make travel more accessible for deaf and hard of hearing travelers is have captioning on all the time. We still have a ways to go but technology is improving to a point where we now have live captioning. It would be fantastic to see live captioning available everywhere from flight announcements to walking tours and such. As you can see in the picture I took during my last trip on Delta Airline, I was pleased to see they provided a text message on their screen informing me of an announcement in progress. I had no clue what the announcement was about but such experience was non-existent ten years ago. It’s great to see Delta informing their passengers an announcement is in progress but what are they announcing? This is where live captioning benefits everyone. According to the United Nations, one out of five people have a disability. That’s 20 percent of the market. Add a traveling companion in the picture such as a coworker, family member, or a friend, that number goes up to 40 percent. By making travel more equally accessible for both people, the travel industry is able to capture a greater market than without. Q7 What would you tell other deaf people that may be hesitant to travel? Traveling is about experiencing life outside your comfort zone. You only have yourself to blame for holding yourself back. Once you let go and make that leap, you are in for an amazing world of experience. Did that sound cheesy? I can’t blame you. Despite traveling for over 40 years, I still experience that moment inside me where I wonder if it’s worth it or not. In the end, all of the experiences I’ve had have been worthwhile. Q8 What do you love most about traveling? Meeting people who share the same passion for discovering new places to enjoy, sharing the culture, and include each other in the experience. Without inclusion, everyone loses. Q9 Besides a cell phone, what is one item you cannot travel without? I might be cheating here but I can’t travel without my backpack. It can hold anything I want to put in it including all the other stuff I can’t travel without. Note from Vicky and Buddy: Yes, that’s totally cheating lol! Q10 We know you house sit like we do. How long have you been doing it? What do you like and dislike about it? Although I grew up pet sitting and took care of my parents’ home while they were on vacation, it wasn’t until 2016 I started securing assignments through Trusted Housesitters. To date, I’ve completed five months’ worth of assignments. One of the amazing house sits right on the sand in Fort Meyers Beach. I enjoy the convenience of staying in someone’s home while exploring the area. It gives me a chance to gain an idea of what life is like as a local instead of staying in a hostel or hotel as a tourist. I’ve stayed in some pretty awesome places that I wouldn’t have visited if it wasn’t for house sitting. It’s not so much a dislike but the challenge of planning ahead that can be frustrating. There will be gaps between assignments that requires looking elsewhere to fill in with a place to stay. Especially when the owner cancels or changes the assignment at the last minute. Q11 Did you have a favorite stuffed animal when you were a kid? That’s funny you asked now that I think about it. While I can’t remember if I ever named it, it was a monkey. Buddy would have enjoy hanging out with my monkey. Check out Mark “Deaf” McGuire’s website! You can also follow him on Instagram and Twitter. I gotta say, that was a great interview! I really never gave much thought to those who travel with a disability. Mark is a true inspiration! We hadn’t either. It’s been an eye opening experience getting to know Mark. Aye, it’s quite the honor to be interviewed to help raise awareness for Deaf travelers and nomads alike. Thank you for the opportunity and I have no doubt our paths will cross again. I can only hope your readers enjoy this interview and become inspired to reach out and make travel even more memorable by being inclusive regardless of any language barriers. Mark I love your story! I admire your patience and persistence too. Many folks are terrified to travel because they fear leaving their comfort zone. I imagine you need to really nudge out in moments, to communicate effectively. Well done bro! House sitting rocks too; we are in Oman now on a 2 month sit, then Cappadocia, Turkey next, followed by Chiang Mai for 6 weeks. All sits, I love it. Wow, those are some sweet assignments. I practically step out of my comfort zone every day. It sure adds to more value to life. Thanks for the comments, Ryan.